We’ll leave the authors snickering on the floor for a moment and move on to the business people – the ones I’ve been training for the last fifteen years. NOTE: All of you who have questions you are afraid to ask “because they’re stupid, ill-timed, embarrassing, etc”…can you please go here and pay special attention to #3? Ask the freaking questions when you have them and stop worrying that others know stuff you don’t. You know things that they don’t. So what? OK, back from PetPeeveVille…and on to Track Changes. This is the feature in Word that lets you trade input on your Word documents, back and forth, like a big OCD ping-pong ball, until it is just right. Once Track Changes is active, edit your document as needed. You will know which areas of the document have changes from the line that is visible in the left margin. Additionally, you will see crossed-out text and formatting comments which are referenced in the right-hand margin. Note: If you just want to VIEW the final document, rather than accept or reject any changes, click on the arrow to the right of the Display for Review button and choose “Final” from the drop-down list. Go to each proposed change and right-click your mouse. A shortcut menu will appear on your screen giving you the choice to Accept or Reject each change. Go to the Changes subgroup on the Review Ribbon (just to the right of the Tracking subgroup). 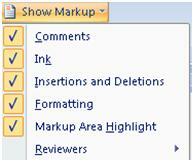 – The Next and Previous buttons will navigate you to each proposed change in the document. – To quickly accept all changes to a document (as you would when receiving a critique from Yours Truly), click the arrow on the Accept button and choose to Accept All Changes in Document. Note: Be sure to turn Track Changes off if you are done making changes to this document or you’ll keep tracking! It’s really beyond annoying when you do that. OK, there you have it… Geek time’s over till next Techie Tuesday. This entry was posted in Technology Fun, Word for Writers and tagged inner geek, Jenny Hansen, Microsoft Word, Techie Tuesday, Track Changes feature, Word for Writers. Bookmark the permalink. Okay I admit. I am the person who won’t ask the question because I might look stupid. Then when I do someone next to me says, “I wanted to ask but was afraid”. Thanks for explaining track changes, you make it sound so easy! I am a techie also, but, use open office. I am going to change back to word as it just seems to have more of the features I want. Thanks Jenny, you’re the best! I don’t have the nifty Windows 7 version but 2000. Very oldy but still goody. It does have the track changes on it. I wondered what it was. I’ll try it out while bearing in mind there’s a better version already out. I’m amazed. Just the other day I cursing out Track Changes because I never learned it and couldn’t figure it out!! So, your timing is perfect and your help is going to save my life. I even told my editor, if Harl is going to revert to Track Changes, they should do a webinar about it, like they do Twitter and Facebook… Heck I learned to type on an electric typewriter, all this stuff is Greek to me. I’ll be unleashing my inner geek every Tuesday from now on! My writers group, the Arizona Novel Writers Workshop uses track changes. I LOVE it. It gives each writer such a cleaner copy of each critique. Plus, no trying to decipher scribbly notes anymore. We print our suggestions and bring them to each meeting. Then give them to each other. Great blog post. Thank you for taking the time to explain. I’d like to keep the link and give it to new members! Many of my writing friends have ripped their hair out over this but if it’s what the editors are using, writers need to be great at it. I use it for critique group (where I had to show all the others how to use it) and at work. My favorite thing by far is being able to just accept someone’s stellar change without having to rewrite. My runner up fave is being able to see the Before Changes and Final views. My editors all use it. I still don’t like it (prefer ‘comments’) rather than seeing all the markups when they decide to hyphenate a word, or add a comma somewhere. But I agree it’s a useful tool. I don’t like my exercise bike much, either, but I use it. LOL on the exercise bike, Terry. I can sure relate to that! Excellent blog! I am a free-lance editor and book editor and Track Changes is the most useful tool in my kit. I now refused to edit *except* electronically, because using Track Changes is — in my opinion — vastly more functional and workable for both author and editor than working from hard copy. Any thoughts on how to avoid getting mind boggled by all the markup? I have authors whose creativity hits rock bottom because of the discouragement “Track changes” gives them. This is such an excellent point! My best suggestion for this is to use the button that says “Final showing Markup” very wisely. Have them switch this to show either Original or Final while they are in the creative stages and then change it back to showing the markup. There is a blog on this site called “The Pros Do the Finish Work” that has proven very helpful to the creative types I know – it changes how they proof and edit. Rather than making it such a continuous, disheartening process, it breaks the process down into specific jobs, leaving creative time alone.